Papers will only be published in English. Manuscripts should be submitted to the Homepage via internet. Submission of a paper to AJIP implies that the manuscript has not been copyrighted nor accepted for publication (or published) by any other journal, nor is it being refereed elsewhere. One corresponding author; if you have more than one author the designation should be submitted with manuscript. All communication will be through the corresponding author. It is our policy to hold the review process within 2 months. Please contact us if you do not receive an acknowledgment of receipt within 2 business days of submission, or if you receive no further feedback 8 weeks after submission. Manuscripts which require changes should be resubmitted in two months to the Editor-in-Chief. No fees for review and publication. Submission needs cover letter having 3 information such as the title and author information, 150 words abstract with keywords, and the lists of 4 experts related to your paper. The experts are not in your institutions, not in the editorial board of our journal, and at least two of whom must be from different countries. Style of submitted manuscripts should be double-spaced, 11-point font written in one single column format. Papers should be 15-30 pages including everything except the abstract and title page. Prepare your manuscript using a word processing program and save it as a .doc and .pdf. Any of these file types will be converted to .pdf format. If you have footnotes, they should be numbered and typed at the bottom of the page on which they occur. Acknowledgment of financial support should be given as a footnote. Price, D. G. (1993) Little science, big science. New York and London: Columbia University Press. Freeman, C. and Perez, C. (1988) Structural crises of adjustment: Business cycles and investment behaviour, in G. Dosi et al. (eds.) Technical Change and Economic Theory, London: Francis Pinter, 38-66. Dosi, G. Freeman, C. Nelson, R. Silverberg, G. and Soete, S.S. (eds.) (1988) Technical Change and Economic Theory, London: Francis Pinter. 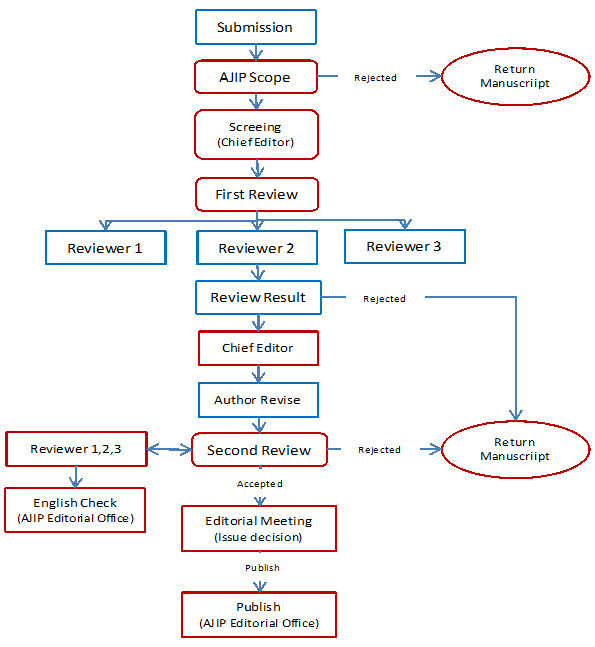 A triple-blind review process is used to assure the anonymity of authors and reviewers in which reviewers are not informed of who is authoring the paper, as well as the authors not knowing who the reviewer is. Submitted papers are first considered by the AJIP Editor to whom papers are submitted. Papers that do not fall within the scope of AJIP are desk-rejected. In addition, papers that fail to meet a minimum threshold for quality and originality will be rejected without being sent out to reviewers. Papers passing through this initial editorial scrutiny are then typically sent out to three referees. If at least one turns down the invitation to provide a review, other referees will subsequently be appointed. Normally, three reviews are needed before the handling. Editor can make a decision as to whether to accept, reject, or ask for a 'revise and resubmit' of the submitted paper. 1. Should include contents not previously published. 2. You can partially (under 10-15%) use your own research results already published. However, it should not be presented as originally published. 3. In case it is already published, you can use your research without citation if it is common knowledge. 4. If it is an abbreviated version of the author’s work, it can be only published by types of research note, book review or case study. Besides, copyright permission from the publisher is needed. Please refer to www.copyright.com. 6. Expansion or advansment of knowledge based on prior works.